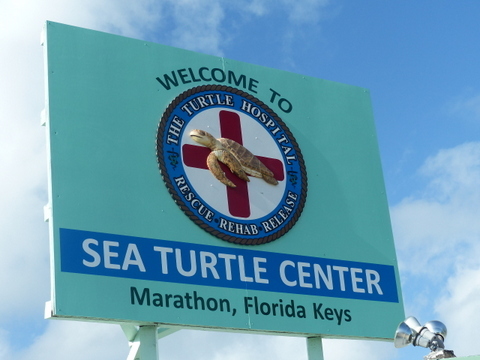 One more afternoon in the Florida Keys before I have to return to snowy Chicago…In the meantime I want to tell you about an incredible facility in Marathon called The Turtle Hospital. Here’s what I now know. There are seven species of seawater turtles in the world, and while they all inhabit (see map) the world’s oceans, five of them can be found off the coast of Florida. Four species are endangered–meaning they risk extinction from being able to live in the ocean. Only the Loggerhead has enough population to say it’s “threatened” instead of endangered. A fine line. They range from a foot or so in shell length (the rarest turtle: Kemp’s Ridley) to the Leatherback, which can be 6′ long, weigh 1,500 pounds, dive 1,000 feet down into the cooold ocean, and travel 13,000 miles (one-way) in its migration. If it is sick or injured, the Leatherback is unable to be brought onshore because its soft shell, made only of cartilage, would disintegrate. Below is a photo I took of a Green Turtle, recovering after swallowing a latex glove. Green turtles were once prized (heck, they probably still are) for their meat (ie turtle soup). 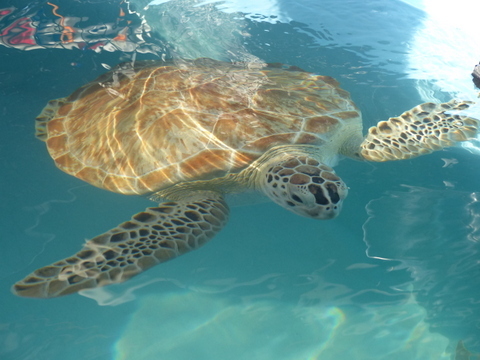 It’s not hard to imagine that turtles are brought weekly to The Turtle Hospital because they have been hit by a boat hull or propeller, or caught in a fishing net. But at The Turtle Hospital, the turtles are often operated on for removing fish hooks (ever see a 6″ fish hook next to an operating table? ), swallowing plastic bags, deflated helium balloons, or large “nests” of fishing filament line. And then there’s surgery for removing tumors–fibropapillomas–which are disgusting cauliflower-like growths which are spread by a virus (like herpes). These infectious tumors, benign but terribly debilitating or fatal, are “the only known disease affecting wild animals on a global basis”. Ugh. Celebrate events without the use of helium balloon releases. Like plastic trash, balloons end up in the ocean, especially when released near the coast. 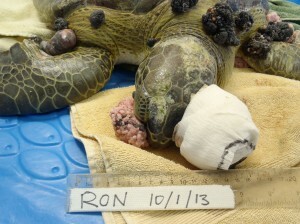 Sea turtles mistakenly eat the balloons and die. Remove recreational equipment, such as lounge chairs, cabanas, umbrellas, and boats, from the beach at night. Their presence can deter nesting attempts and interfere with the seaward journey of hatchlings (all summer thru October). Minimize beachfront lighting during the sea turtle nesting season (May-August) by turning off, shielding, or redirecting lights. Close blinds and draperies in oceanfront rooms at night during the nesting season (May-August) to keep indoor lighting from reaching the beach. When boating, stay alert to avoid sea turtles. Propeller and collision impacts from boats and ships can result in injury and death of sea turtles. Also, stay in channels and avoid running in seagrass beds to protect this important habitat from prop scarring and damage. Avoid anchoring boats in seagrass beds and coral reefs, which serve as important foraging and resting habitats for sea turtles. Use your natural vision when walking on the beach at night. The use of flashlights and flash photography can deter turtles from coming ashore to nest or cause them to abort nesting attempts. Ask your boat captain if he has a propeller guard on his motor. This is controversial (the industry says it is worthless, h’mmm) but asking may alert your captain to how much you care about protecting wildlife, including manatees and turtles. Thanks for sharing sunny Florida with us. As always your descriptions of places and plants brings us right there. Sunny but cold here in CT today… some of the bush branches are turning pink and we are moving into “stick season.” The Weedpatch Gazette is always such a joy to read. This was so interesting to read and learn more about “turtles”! On layovers in Hawaii as a flight attendant, I enjoyed seeing quite a few turtles who seemed healthy. Time to make sure they remain healthy all over the world! Thanks for sharing your info. Thought-provoking article on sea turtles. As I am close to the ocean in Newport, RI – we occasionally get leatherbacks washing ashore! These turtles have a great range in their environment where they could live. Thanks for sharing some sunshine from the Keys, Rommy! Being a nature lover & lover of all wildlife, I have noticed the life threatening impact “man” can create in our environment, by simple – mindless – thinking. Whether on land, air or sea, perhaps people can think mindfully about the way they move through nature. Their actions & their garbage, destroys wildlife. Think. Pick it up, even if it’s not yours. The world is our sanctuary. Being a lover of nature & all wildlife, I’ve noticed the life threatening impact “man” can create in our environment. Simple – mindless – thinking. On land, air or sea, it takes thinking mindfully, about the way we move through nature. Pick it up, even if it’s not yours. The world is our sanctuary.